Cleverly reimagined Jewish icons and iconography, on menoras, mezuzot and pendants meant to evoke our favorite Israeli cities, grant a modern edge to holiday gift giving. 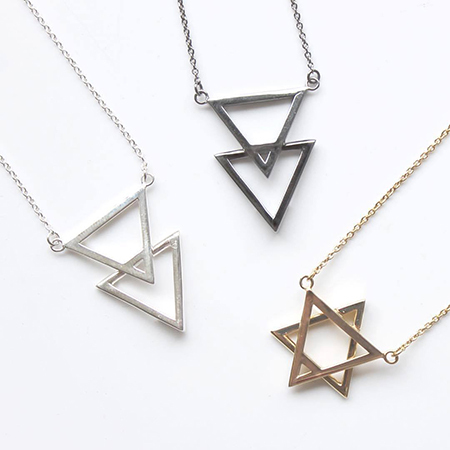 And that best-known of contemporary symbols of Jewish affiliation, the Star of David or Magen David—a favorite with many jewelry wearers—has seen renewed attention from both designers and jewelry lovers. Jewish educator, doctor and children’s advocate Janusz Korczak sacrificed his life to care for 200 orphans from the Warsaw Ghetto, accompanying them to Treblinka, where they all were murdered. A new menorah, created by Judaica artist Gary Rosenthal with Risa Borsykowsky, owner of Jewish Gift Place, and based on a memorial to the pediatrician in Manhasset, N.Y., commemorates the doctor’s bravery. The menorah, in brass, copper and steel, comes in small (left), from $118, or large, from $180. 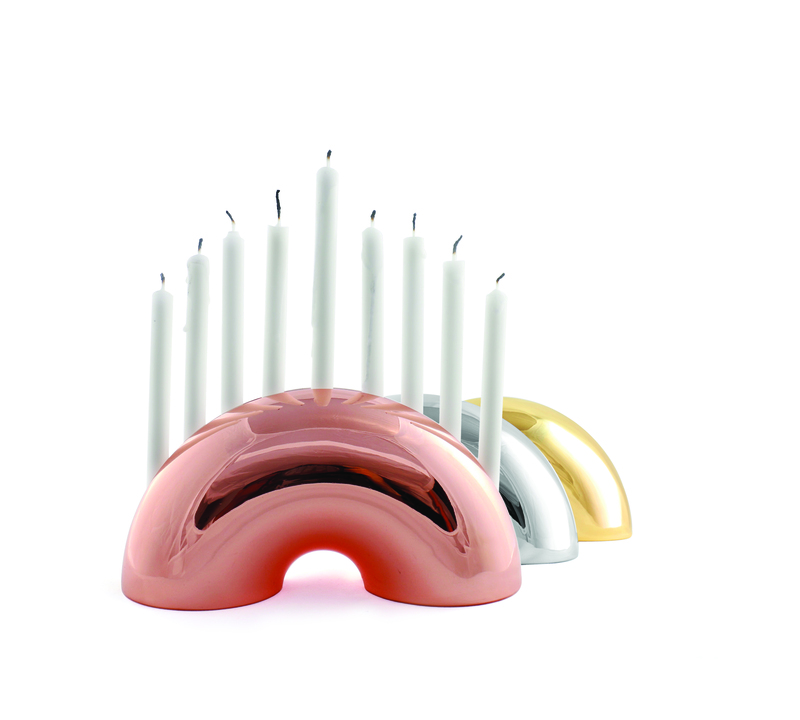 The Nosh Menorah, available in chrome, brass and rose gold, starting at $200, is a sleek sculptural reflection on a Jewish culinary classic—the bagel—from new design house Modern Mensch, and also available at The Jewish Museum shop. Elegant and playful come to mind when describing Melanie Dankowicz’s Judaica, and her stainless steel Magical Menorah, iced with floral curls and curlicues, from $195, and joyful Dancing Dreidel, from $68, are perfect examples of the metalwork and papercut artist’s appealing style. Tin cans, spice tins and vintage metal objects are the raw materials that artist Harriete Estel Berman uses to create one-of-a-kind recycled Judaica, from Shabbat candles and Seder plates to tzedakah boxes. Check out her mezuzah cases—one was once a JNF collection box—from $75, for a mezuzah case with closed back andinserted nonkosher scroll, to $175, with removable back. Her work is also part of “HOME(less),” a new exhibit at Hebrew Union College-Jewish Institute of Religion in New York City through June 2018 that looks at the idea of home in contemporary society. and rings in gold or silver, ranging from $55 to $109. Using sterling silver, black silver or gold vermeil, Adornia’s Star No. 263 deconstructs the symbol to its geometric components in a pendant that can be worn as two triangles or as a complete star, available at the National Museum of American Jewish History Store, from $285 to $325. For traditionalists, there are many new options, such as Alef Bet’s delicate 14K gold pendant necklace, from $169 to $275, and 14K gold star set with diamonds, from $340. New York-based jewelry designer Peter Hofmeister uses the Star of David in etched patterns on his hand-crafted polished brass cuff bracelet, from $225, and 14K gold-filled pendant necklace, from $250. The design is also available in a set of 14k filled gold earrings. 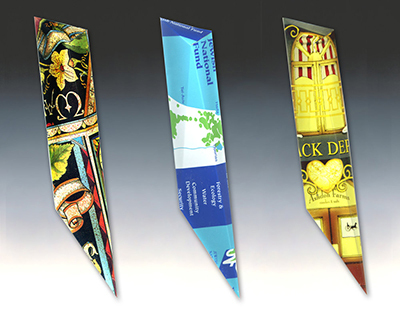 Hofmeister, who got his start designing for Ralph Lauren, created the set exclusively for the Jewish Museum. 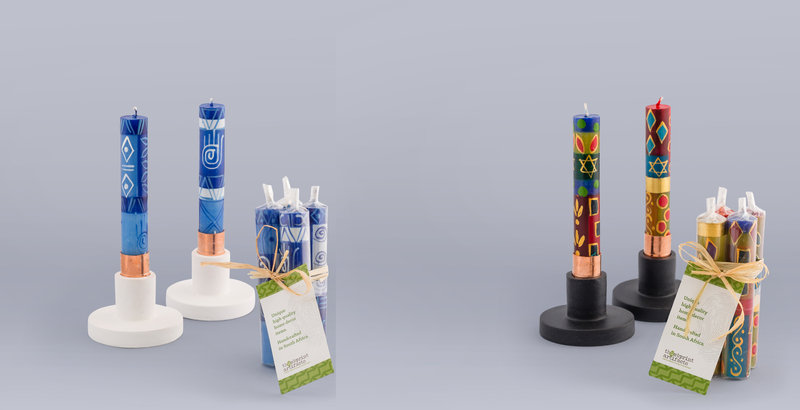 Kapula, a certified Fair Trade Organization located in South Africa, employs the talents of women artisans to create its vibrant hand-dipped and hand-painted Shabbat and holiday candles. Tapers range from $16 to $20 for a set of 4; pillars and cubes from $10 to $28. From “Iron Lady” Golda Meir on a belt buckle (starting at $40) to Pop Art Theodor Herzl on a mezuzah case (from $32), Israeli designer Ofek Wertman brings famous Zionist faces to wearables and home goods.